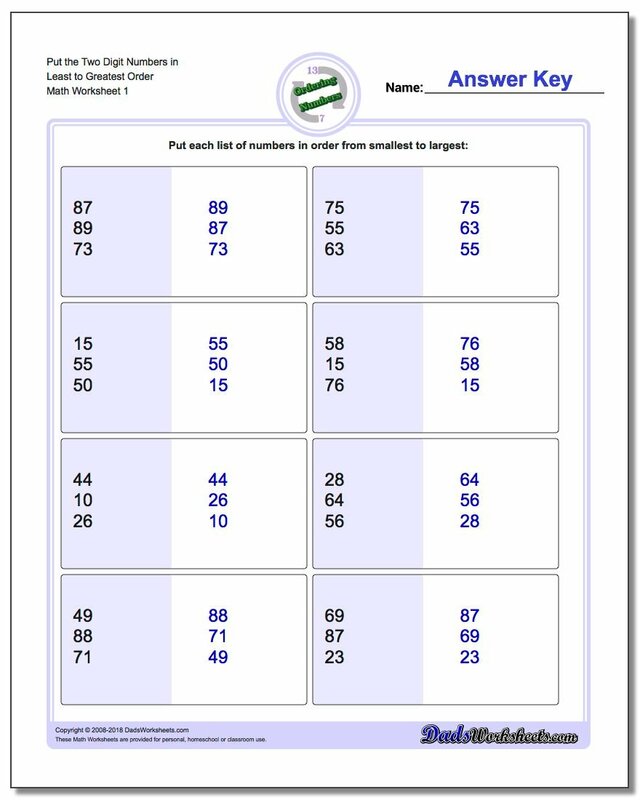 This section includes a complete set of ordering numbers worksheets covering a variety of scenarios starting with simple whole numbers in 1st grade and 2nd grade, larger numbers through 3rd grade and 4th grade and up through ordering decimals and ordering negative numbers in 5th and 6th grades. It may seem as though ordering numbers is a trivial activity, and as adults we often underestimate the complexity this task requires. You may only be thinking about ordering whole numbers, which admittedly isn't much of a challenge. However, as soon as we introduce decimal numbers, the fun begins. Adding digits to the right of the decimal place may make a number look longer, but in reality it's actual magntitude may not change by much. However, a student just learning how to understand decimals may see a number like 1.00001 and think that it's greater than something like 6. It's longer right? Longer means 'greater than' doesn't it? Not always. Keep going from there and realize that negative integers, even having digits only to the right of the decimal, are smaller in magnitude if they have more digits. 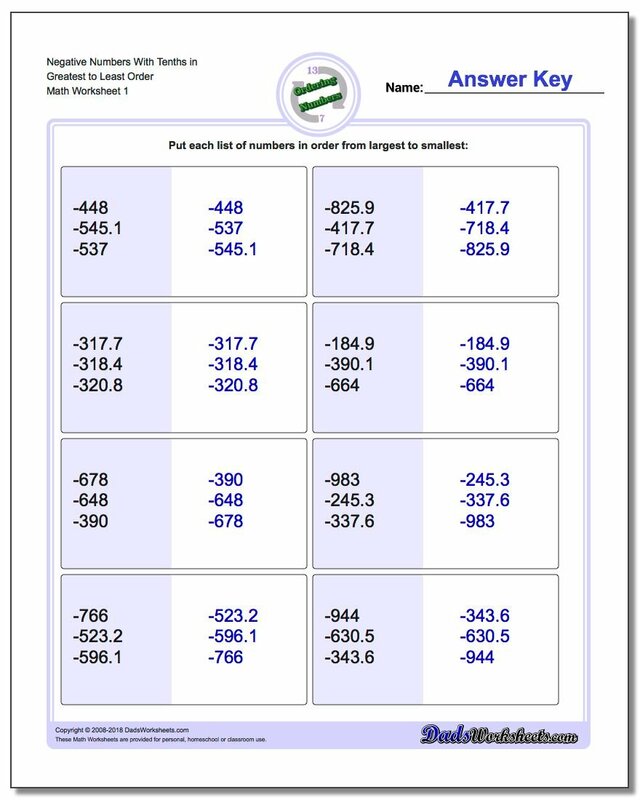 Start mixing up negative and positive numbers, with and without decimals, and you'll quickly realize that many of the simple shortcuts a student may pick up to figure out how numbers are ordered will be defective. Ordering Numbers Worksheets to the Rescue! 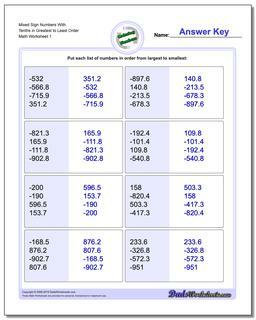 The worksheets in this section require ordering of sets of positive whole numbers with the same place values in least to greatest (ascending) order, starting with one and two digit values and progressing through six digit values. 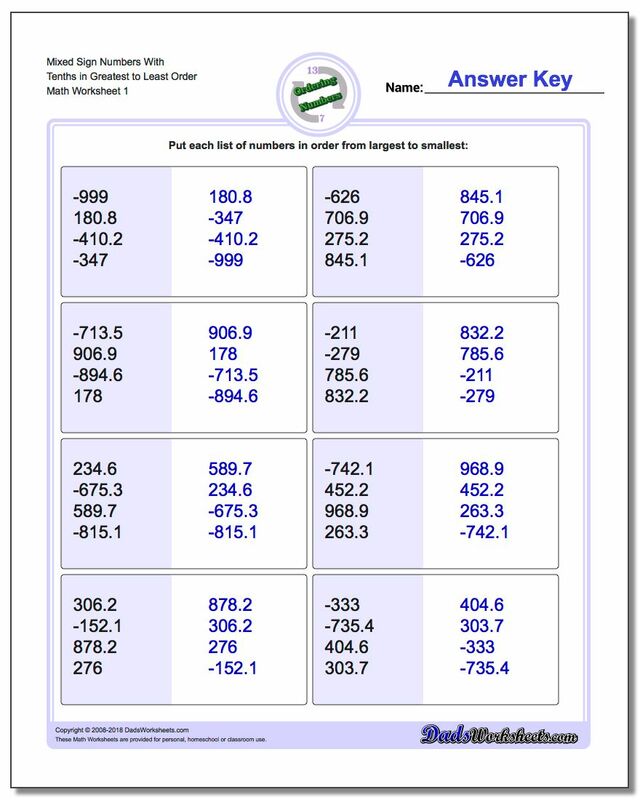 These worksheets require ordering sets of positive whole numbers with the same place values in greatest to least (descending) order. 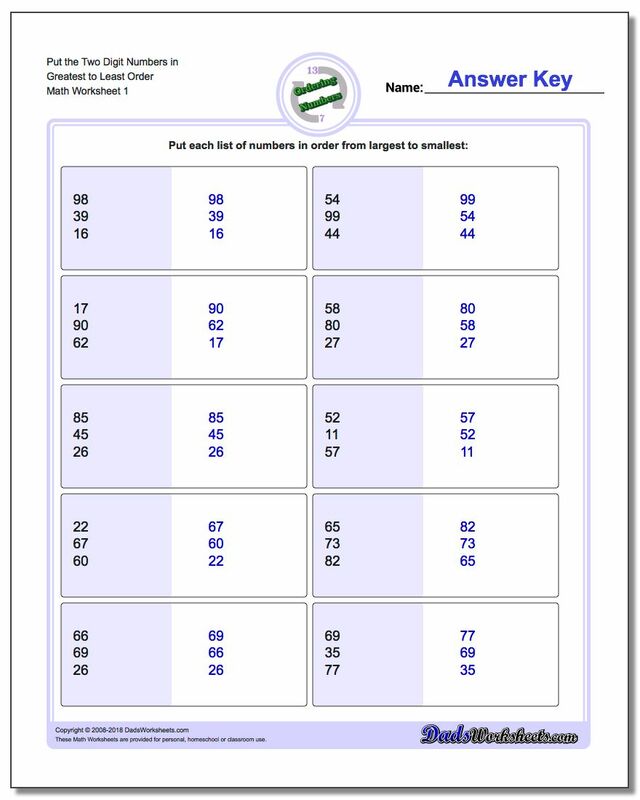 This section provides ordering numbers worksheets with sets of positive whole numbers with different numbers place values. Worksheets for ordering sets of negative whole numbers with different place values (numbers of different lengths). 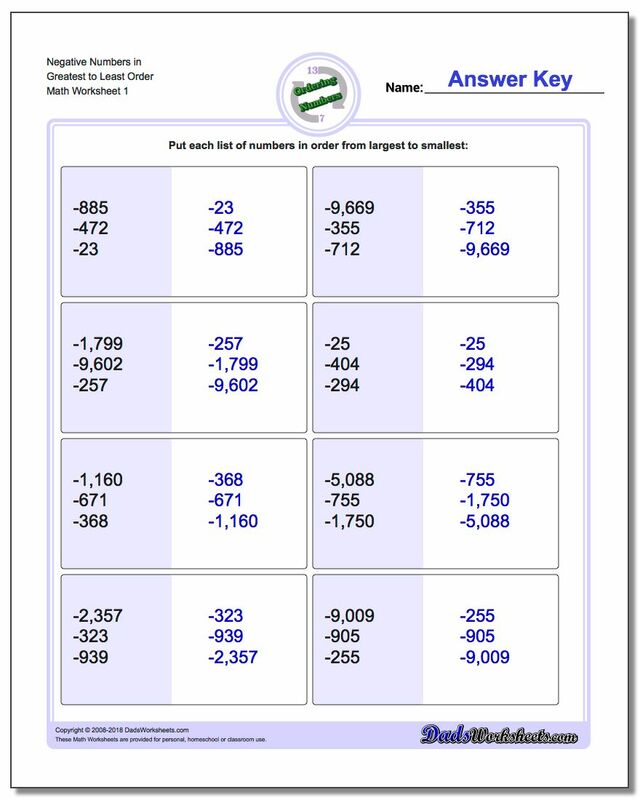 These ordering number worksheets have problems with sets of negative decimal numbers. 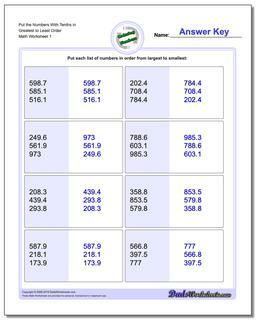 More worksheets requiring ordering of sets of positive and negative whole numbers with different place values. 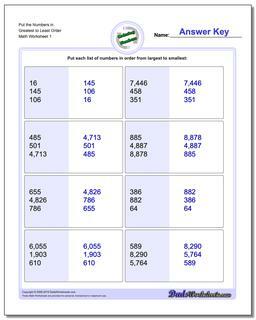 After learning to count numbers, order numbers activities are a useful way to test a students number sense. Many times, a student is capable of counting numbers, but much of this memorization is more about the recitation than about developing an actual sense of 'how big' a particular number is. Ordering numbers is a a way to help students to start thinking about the magnitude of numbers and what they mean instead of just their names. 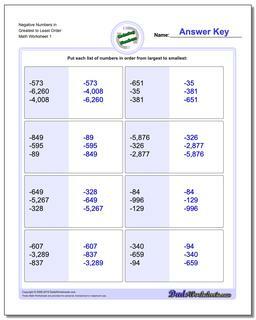 You'll find sets that deal with putting numbers in increasing order (least to greatest) as well as decreasing order (greatest to least) depending on your needs. Ordering numbers requires students to understand comparisons. Typically students are able to compare two digit numbers by the time they reach first grade. If your students stuggle with the ordering numbers worksheets, try doing some of the greater than and less than worksheets and try to reinforce how those concepts relate to putting smaller numbers before larger numbers when constructing an ordered sequence. The ordering numbers worksheets in this section of the site have ranges of values, so you can start off with smaller values and work your way up. 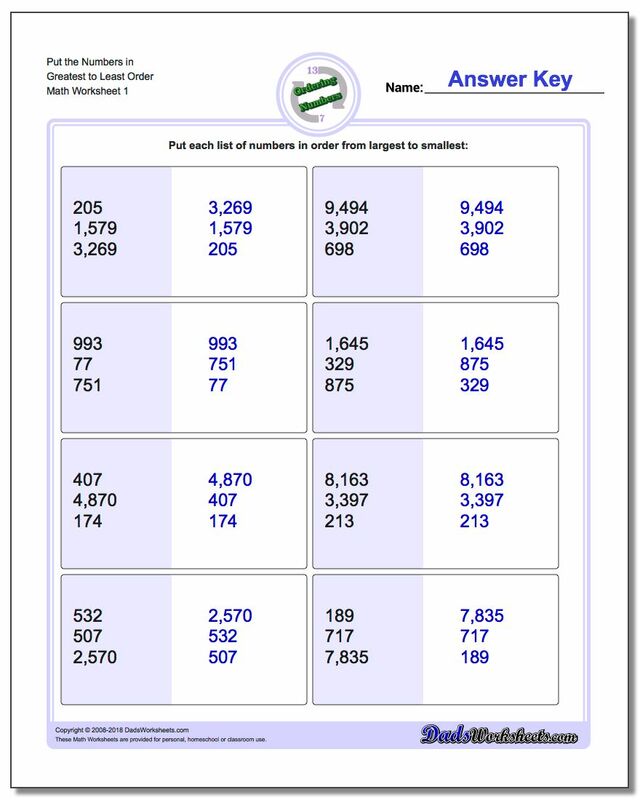 Most sets of worksheets begin with two digit numbers, and then progress up through six digit values. These worksheets are more appropriate in 2nd, 3rd and 4th grade where students have a more developed sense of place value. 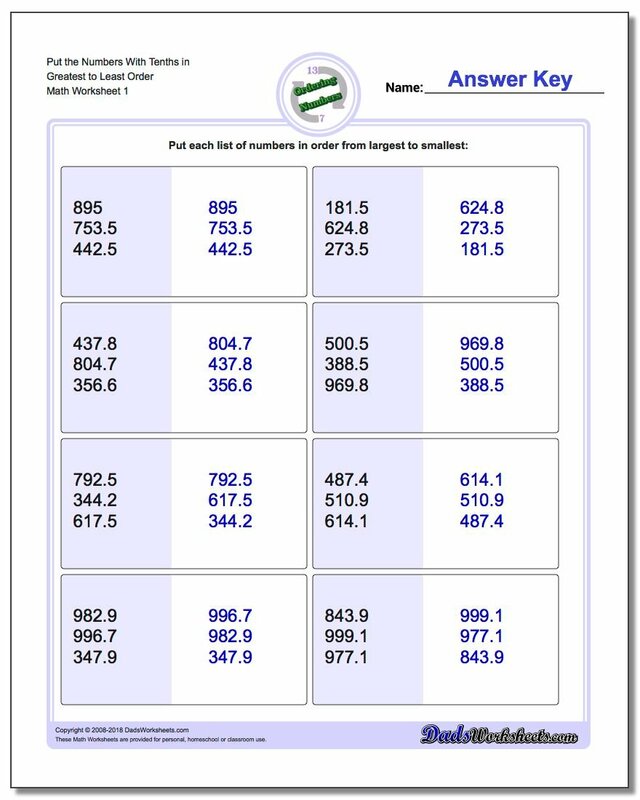 More advanced ordering worksheets include ordering numbers with decimals and ordering numbers with negative numbers, and these worksheets can reinforce those topics when they are introduced, typically by 6th grade.